If you have a daughter, niece or girlfriend then you already understand the importance of hair and accessories to girls. Girls love to look pretty and adorn themselves whenever they get the chance to. Hair is so important to women over all. Hair bows can be the perfect accessory for little girls. Hair bows come in countless shapes, colors and sized. The new hair bow trends include ribbons, oversized flowers and wide cloth bands that can be worn with more than one outfit. Hair bows are not hard to make either. They take a few minutes to put together and of course they need time to dry. However, this article will tell you how you can make your own hair bows. I’m sure the girls you love with adore them. Read on for more information. Tie a bow. If you don’t know how to tie a great bow, research how online. This is important for the presentation of your hair bow. Tie the bow by making two “bunny ear” loops. Hold one loop in each hand and cross them. Pull the loops through the hole and adjust the ends of the bow. 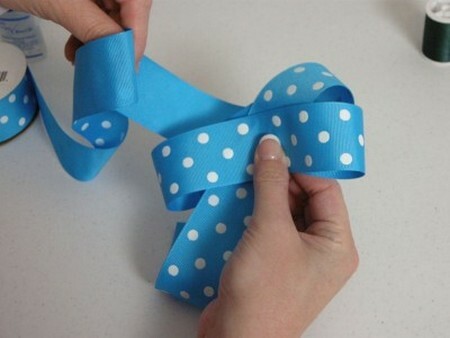 Make the bow even on both sides and also make the two tails equal in length. This is about as perfect a bow as can be made. To form a bow for a head band, you’ll need to be able to make a knot as well. Place the ribbon down the hair, wrap the ends on top of the head. Make a knot and tie a bow just like the step above this one. Remember to adjust the ends of the bow and the tails. Make a larger bow to slide onto the plastic headband and position it towards the side of the head. This adds a little pizzazz to your presentation. Make accessories that will last a while. You are free to use your favorite colors, ribbons and more. Tie another knot and place a bow right on top. When the bow is the size you need, use a clip to position your new creation off to the side of the hair. Use the glue gun to secure all the decorative pieces in their proper places. Allow the hot glue to dry completely before wearing. You don’t want the decorative pieces to fall over when you decide to wear your new hair piece outside. Wear your custom creations out with elegance and style. Enjoy your new custom made hair bows.